BMW today delivered the first all-electric ActiveE in the US and began the next chapter in its electromobility strategy. 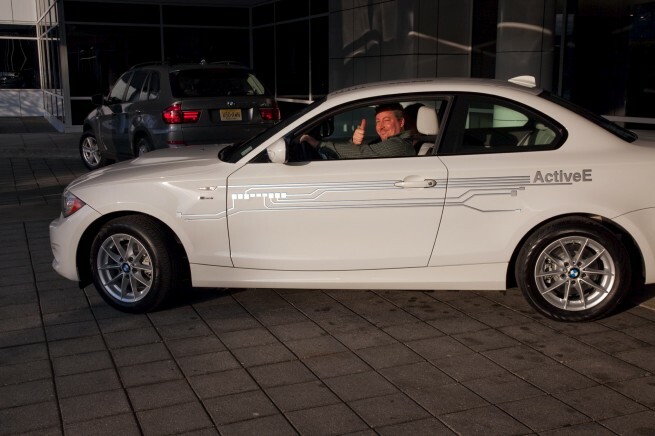 Ludwig Willisch, President and CEO of BMW of North America presented the keys to a BMW ActiveE to Tom and Meredith Moloughney who will begin their two-year lease today. As one of the inaugural MINI E pioneers in 2009, today they officially became the first ActiveE Electronauts. The BMW Group’s electromobility development strategy began with the MINI E Field Trial in the summer of 2009. When the MINI E trial program began, one of the main open questions was, could a private individual live with an electric vehicle on a daily basis without changing their driving habits? The MINI E pioneers proved without a doubt that not only could it be done, but that doing so required no change in their daily routine, with the exception of plugging-in instead of stopping at the gas station. No one has proven the viability of an EV as daily transportation more conclusively than the Moloughneys, who logged over 72,500 miles in MINI E # 250 in just two-and-a-half years. That is as much driving as the typical American driver does in five years and they did it without burning so much as an ounce of gasoline. The ActiveE is the only car that is 100% Electric and 100% BMW, providing the performance and efficiency everyone has come to expect from The Ultimate Driving Machine®. With output of 170 hp and maximum torque of 184 lb-ft from a standstill, The BMW ActiveE accelerates from 0–60 mph in under nine seconds. Newly developed lithium-ion batteries facilitate a driving range of up to 100 miles on a full charge. project i – research and development of tomorrow’s mobility. The BMW ActiveE is the BMW Group’s next step towards an emission-free, mass-produced electric vehicle. Within the framework of project i, the BMW Group is carrying out research and development work on the development of electrically powered vehicles. The next step will be the BMW i3 due to launch in 2013. It will be designed to meet the demands of a sustainable mobility solution for congested urban areas. For this reason, the drive components and battery technology that will be used in the BMW i3 are being tested in the BMW ActiveE. Ongoing field tests involving more than 600 MINI E cars, including 450 in the US, have already provided vital knowledge about the demands on future electrically powered production vehicles. Beginning with year in the US, Europe and China, a test fleet of over 1100 BMW ActiveE vehicles, produced at BMW’s Leipzig plant, will provide further valuable insights into the everyday use of the vehicle. The findings will serve to deepen the knowledge already gained on the everyday use of electric vehicles and to learn more about customer requirements. The feedback from customers testing the MINI E and the BMW ActiveE will be fed directly into series production of the BMW i3, which will be launched in 2013.